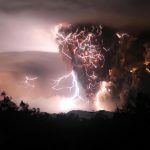 The micro view can be used to help during the storms of life. Have you noticed that there are two ways of using the iterative growth model? The one we have discussed most frequently thus far is what you might think of as the “macro” view because it helps at a higher, or “big picture”, level. In the “macro” view, a person is thinking about the activities they are employing to grow in knowledge, character and behavior. What books am I reading? What disciplines do I have in my life? How am I handing real-life experiences? Still within the macro view, one may focus these activities on a theme; i.e. joy, compassion, humility, or perseverance. The questions then become for focused. What books am I reading that will help me become more joyful? Which disciplines am I practicing that are designed to make me more joyful? What near-term opportunities do I have to be more joyful? I want to add a second view today that you might think of as a “micro” view. The micro view is all about using the same model, and even the effort of the “macro” view, to help you obey when it matters most…a specific situation that demands faith and obedience. You can think of it as a way of being more successful obeying (from the growth model) God using another iteration of the growth model itself. Confused? Me too…let’s use an example. Right now, stress/anxiety management is tops on my personal growth priority list. Why? Because I have lots of…let’s say “opportunity”…to use real life experience to help me conquer stressful and anxious situations. Catch my drift? No? How’s this … I’m stressed out because I have a full-time job, full-time ministry, and a full-time family; and, I sold my house, gave up my weekend looking at houses, and our best option seems to be living with my in-laws for ~5 months while our new home is being built. Better? I’m not going to be exhaustive on everything that I am doing to deal with the stress/anxiety, because it can get complicated; but, I wanted to setup a real situation to illustrate the use of the growth model in situations like this. Here’s how it works…very simple. When I feel “anxious”, I ask myself a simple question: what Scripture (Hearing God) am I not believing (Believe God) that is causing me to be anxious (Obeying God)? The extent to which you have already been applying the macro view of “hearing God” (i.e. reading His Word and/or commentaries on His Word), “believing God” (i.e. disciplines such as Scripture memory and meditation), and “obeying God” (i.e. successfully handing anxious situations) in the theme area of joy/contentment/anxiety is the extent to which you will be able to use the micro view successfully. For, if you are not reading (hearing) and memorizing (believing) God’s word during times of peace, how are you going to recall it when you really need it? And, because spiritual growth is iterative (success breeds additional success), you need to be able to handle the small situations (obeying) before being able to handle the large ones. The purpose of trial is not to escape the trial; it is to become better prepared for the next trial. In my case, I have several passages, promises, concepts that I fall back on. My favorite passages are probably the ones most obvious to you; e.g. Phil 4:6-7, Ps 23. These two passages alone contain enough spiritual truth that if I would only believe it, I would not be anxious. And so, I recall it and trust it. Do the feelings go away? Not always for long, but can I make it through the trial with my faith intact and stronger, YES! And that, my friend, is the purpose of our suffering: to strengthen our dependence upon the Lord. The purpose of trial is not to escape the trial; it is to become better prepared for the next trial. Therefore, allow me to encourage you. Next time you are in a tempting situation, think about which Scripture you do not believe that would cause you to consider the sin. Next time you are suffering, think about what Scripture that if you would only believe it would help you obey God and grow in your faith. Drive every tricky situation back to what God has said and your faith in Him. And remember, to be successful reacting you must be proactive between the storms. Now that we have established the basis for our two major growth dimensions, loving God and loving others, we can begin to discuss how to measure and visualize maturity. For now, this post assumes that there is a means by which we can measure maturity (granted, a big assumption) and focuses of visualization for the purpose of reinforcing the concepts already discussed. There are four views discussed in this section. 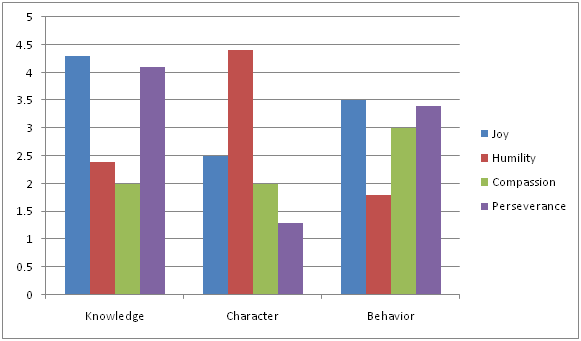 The first is mostly a basis to begin with…a simple bar chart reflecting the current state of a disciple in terms of how far they have progressed along the knowledge, character and behavior dimensions. Here we see that this person has grown most in knowledge, second in behavior, and third in character…a pretty typical distribution. It is not depicted, but one can easily see where phases of maturity can be drawn at various levels. 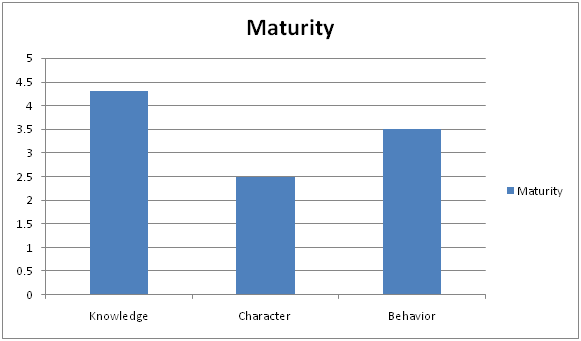 If the range of maturity values is 0 to 5, perhaps phase 1 is 0-2, phase 2 is 2-4 and phase 3 is 4-5? Now if we were break down each dimension into smaller parts using the cross-cutting themes (or categories) discussed earlier, this bar chart might look something more like the following. Here we can see inside each of the major dimensions to understand the component pieces. This tells us what areas of knowledge, character and behavior are strong and which are weak. 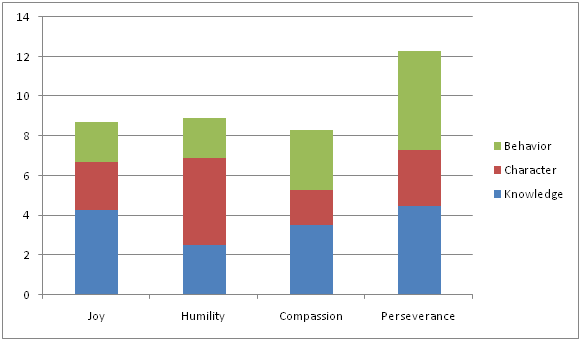 In the graph above, we see that this person’s attitude is very humble but not very persevering. With this information, a faith coach can target this area of weakness with disciplines aimed at building self-confidence and steadfastness unto overall perseverance. Other views can be helpful as well. By stacking the values, we can get an aggregate view of knowledge, character and behavior. This is basically the same data as the earlier chart, only the bars are stacked one on top of one another rather than being side-by-side. The value of the previous chart would be able to see phase levels of each theme within each dimension independently; i.e. I can clearly see that this person is a phase 3 disciple with regard to a humble character but only phase 1 with regard to a persevering character. 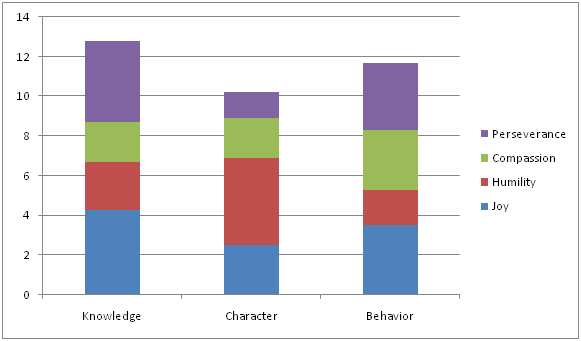 The value of this stacked bar chart is to see keep the aggregate knowledge, character and behavior scores (and phasing) and yet add the component pieces to see relative (as opposed to absolute) strengths and weaknesses. Finally, it’s important to see end-to-end measurements of each of the themes. This chart looks similar to the last chart, but you’ll notice that the themes and dimensions are reversed so we can see maturity by theme rather than by dimension. I can see were my disciple is with regard to joy, including each component piece of knowledge, character and behavior. What is the point to all this visualization mumbo jumbo? The point is that in order to be effective as a disciple and a disciplemaker, we must have some way of understanding where we are, where we are going and how we’re going to get there. The assessment tool can be used to gain a subjective understanding on where a disciple is in their walk; graphs like these can be used to visualize the conclusions; and discussions on what activities are appropriate to strengthen weak areas may then take place. At the end of the day, it’s simply about being more intentional about becoming more like Christ. What is the primary purpose of a man? What is their reason for being? Why are we all here? Clearly these are deep questions that have answers only God can fully understand. Though I will not pretend to answer fully in one blog post I do believe God has provided a simple view that will allow us to move forward confidently. In the book of Ecclesiastes, Solomon struggles to answer these questions. It is the outpouring of a man who wasted the better part of his life seeking significance through what the world has to offer. His recurring mantra is “Vanity of vanities…all is vanity”, because he eventually came to understand that our significance cannot be found in anything the world has to offer. It can only be found in what God has to offer. His final conclusion is revealed in Eccl 12:13, “The conclusion, when all has been heard, is: fear God and keep his commandments, because this applies to every person.” Note that the two directives, fear God and keep His commandments, are inseparable…genuine reference for God includes obedience. Therefore, we may confidently state that our primary purpose in life is simply to demonstrate our respect of God by obeying Him. That is, we love God when we listen to Him, trust Him and then obey Him. We seek specific truths of God from His Word (The Bible), we believe the truth granted to us, and we live consistent with that belief. If a person does these three things, they express love for God in its purest form. To the extent that strive to know God’s Truth through the bible, believe it to the point that we take action (rather than simple intellectual assent), and actually do what it says is the extent that we love God. When we fail to crave God’s word, believe what we know, or obey what God has said we are being unloving toward God. Joyfully forget yourself and focus on others forever. There are four components intentionally includes in this phrase: joy, humility, compassion, and perseverance. It is believed that upon inspection of God’s word, loving others can be boiled down to these four major “themes”. We love others when we forget about ourselves (humililty) and focus on the needs of others (compassion) with great passion and contentment (joy) for the rest of our days (perseverance). That is, we love others when we forget about our own needs to focus on the needs or others, and we are most supremely fulfilled doing this consistently throughout our lives. Now, let’s connect this to the Iterative Growth Model. People grow along three dimensions: knowledge, character, and behavior. They grow along these dimensions by hearing, believing, and obeying God iteratively and incrementally. Remember also that we briefly discussed themes. The themes are characteristics that are developed by successive iterations of hearing God, believing God and obeying God and can be considered components of knowledge, character and behavior. For example, if one theme is compassion then I can grow in my knowledge of compassion, belief that leads to compassion, and compassionate living. 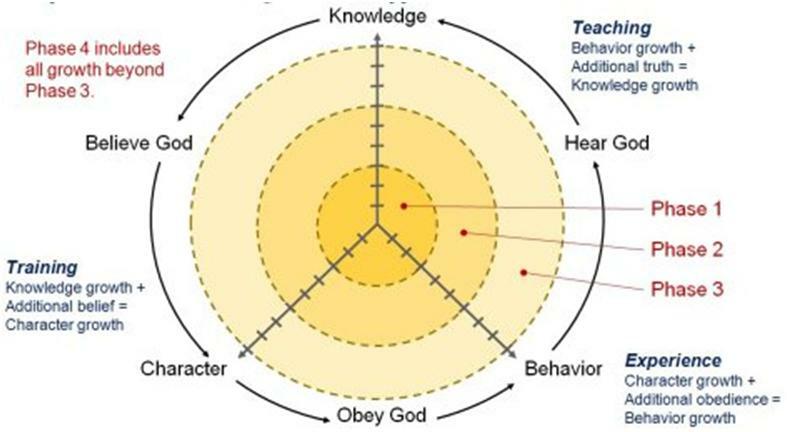 Connecting the iterative growth model to loving God and loving others, the hear-believe-obey cycle directly maps to “Loving God” as described above. Similarly, the themes map directly to “love others”. There are four major themes: humility, compassion, perseverance and joy. These themes map directly to our tag line for loving others: Joyfully (joy) forget yourself (humility) and focus on others (compassion) forever (perseverance). The significance of this is important. This statement implies that we cannot love others unless we first love God. 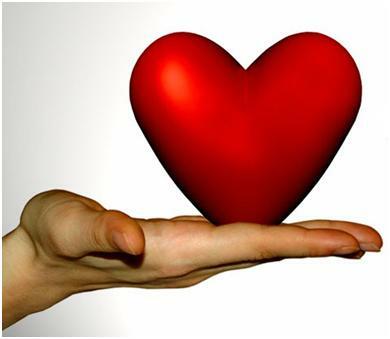 It is our love for God that empowers and even compels us to love others. More than this, love for others is evidence of a love for God. Hence, Jesus words on Matthew 25 where he states that we have loved Him when we loved others. His statement here is based on this foundational truth that God’s people, those that love him, love others – it’s just what they do. Being a disciple means accelerating this trend…forever. In my last post, I introduced the concept of a growth theme. Think of themes (joy, compassion, humility, perseverance) as the more concrete sub-components of the growth dimensions (knowledge, character, and behavior). And remember, growth on these dimensions within the themes is a result of hearing, believing and obeying God. Later, I’ll go a little deeper on hearing, believing and obeying God…the things we do. But first, lets look a little closer at what we are trying to become (increasingly joyous, compassionate, humble, and persevering). The above statement is something I made up as a kind of personal mission statement. Notice how it includes each of the four growth themes…joy, humility (forget yourself), compassion (focus on others), and perseverance (forever). We are followers of Christ if we do this increasingly, genuinely and in the context of God’s truth. Note that I did not say we are “saved” because of it. We’re “saved” because we professed faith in Christ and He gave us life by His grace alone. What I’m taking about here is actually following Christ after we have been regenerated. Now, let’s look under the hood. Are four themes really enough? What about love, wisdom, righteousness, contentment, faith, dependenance, generosity, etc? As I said before, we created a mind map to organize these characteristics so that we could get our arms around the different facets and begin to eat the elephant one bite at a time, so to speak. Remember, this is one of an incalculable number of possible arrangements. This is just one that works for our purposes. I’m happy to take feedback on it, because I do want to improve it…but, let’s not miss the forest for the trees either. We can develop a means of helping people understand where they are in their walk with regard to joy, humility, compassion, and perseverance. This then drives where/how they spend their time addressing areas of weakness (rather than simply ammassing knowledge by an endless stream of “bible studies”). The intent of “assessment”, would be to help someone understand that contentment is a bigger issue in their life than say generosity. Guidance can be attached to the same vocabulary. Guidance (e.g. passages of scripture, teaching, books, podcasts, disciplines, ad-hoc experiences and advice, etc) can be provided on how to become more generous, for example, and loaded into a shared repository. Now that guidance has been loaded against a specific vocabulary, and a person understands their need using the same vocabulary, an extremely efficient search capability can be put into place that helps a disciple find exactly what they need almost immediately. There is alot more to be said, but alas…it will have to wait until next time. Until then, I will continue to pray for all of you as you strive to become more like our Savior. spiritual growth occurs along three dimensions: knowledge, character and behavior. growth on these three dimensions occurs by iterations of hearing, believing and obeying God. And, we used the following as a picture to illustrate the basic concept. Now let’s break down the components of knowledge, character, and behavior so we can get to something that each of us can use in our daily lives and help others to do the same. Several months ago, some faithful buddies and I brainstormed “christian attributes”. We asked, “what are the characteristics you would expect to see in a follower of Christ?” Obviously, many attributes came to mind, including wisdom, righteousness, humility, generosity, love, contentment, etc. We then organized them into four major themes: joy, humility, compassion, and perseverance. Therefore, when we talk about growing in knowledge, we’re really talking about growing in knowledge of what it means to be joyous, humble, compassionate and persevering. When we talk about growing our character (internal attitudes and unseen behaviors), we’re talking about developing a joyous, humble, compassionate, and persevering character. When we talk about growing in behavior (externally observable behaviors), we’re talking about acting joyous, humble, compassionate, and persevering. Clearly, there are many, many ways to organize these attributes. This is just the way we did it, and I think it works pretty well. In future posts, I can share the detailed “mind map” that describes how we organized the attributes and dealt with “super-themes” like righteousness and wisdom. Now, remember the second principle that describes how we grow in the three dimensions and their four components. Generally speaking, we grow in knowledge by hearing God; we grow in behavior by believing Him; and we grow in behavior by obeying Him. Therefore, we grow in our knowledge of what it means to be joyous by hearing what God has to say on joy; we grow in chracter with respect to joy by genuinely believing these truths from God; and, we grow in joyous behavior when we obey these new truths that we genuinely believe. I have lots of examples from Scripture and from my own experience to share, and will do so over time, but for now let’s start with one from Acts. Do you remember Paul and Silas in prison (Acts 16)? They behaved in an extraordinary way. First, rather than grumbling (which I’m sure I would have been), they are singing and praying. Then, when the earthquake hits and the prison doors are busted open, they did not flee. Now look, I’m excited by the growth God has caused in me over the past several years, but I am nowhere near this level of mature behavior. Paul and Silas were so focused on the welfare of their guard, they essentially sacrificed themselves for him…a non-Jew and a non-Christian. Why on earth would they a) be singing in prison; and b) not leave when God “obviously” was trying to set them free by way of the earthquake? In the first case, they had learned to be “content in all circumstances” (we bucketed contentment within the joy theme). In the second, they had serious compassion for the jailor and knew what “the right thing to do was” (see my previous post). Why were they so joyous and compassionate? Because they knew the promises of God and they genuinely believed them. They had already invested years into knowing God’s word and practicing the disciplines required for training themselves for just such a moment. Of course, Paul (at least) had the additional experiences of supernatural encounters with God, but these are not necessary to grow to the point Paul was. We can all get there by studying God’s word, proactively training ourselves to believe it, and them acting upon it in any circumstance. And so my encouragement is simply this: know God’s word, believe what you know, and obey what you believe. Over time, learn a little more, believe a little more and obey a little more. Just keep moving forward and never stop. If you need help, please raise you hand. I, and many others joining this community, are here to help you!